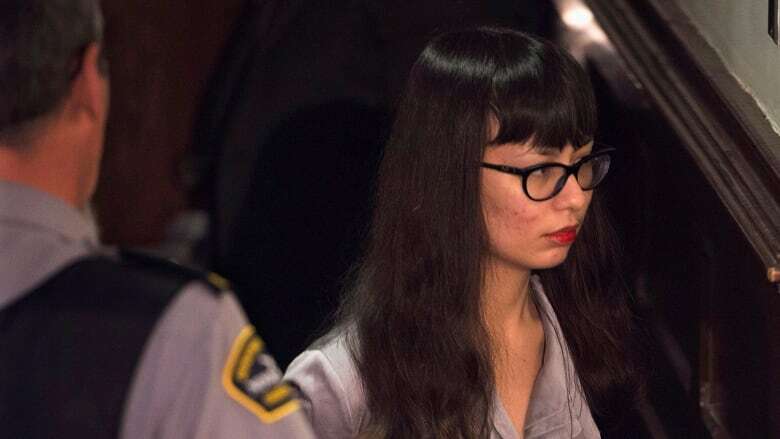 An American woman who took part in a plotted Valentine's Day shooting rampage at a Halifax mall has been sentenced to life in prison. Lindsay Souvannarath pleaded guilty last year to conspiracy to commit murder in a plan that would have seen two shooters open fire at the Halifax Shopping Centre food court in 2015. She will serve at least 10 years before she is eligible for parole. "The impact of an offence like this would have changed the city forever," said Crown prosecutor Shauna MacDonald. "It seems like something that's only in the news and happens elsewhere. This made it very real, brought it home to us that our community is at risk, was at risk, and something very serious was only narrowly averted by the quick action of the police." The sentencing comes exactly 19 years after the Columbine High School massacre, something Souvannarath and her co-conspirators had said was their inspiration for the foiled plot. Police thwarted the planned attack after receiving an anonymous tip, but not before Souvannarath boarded a Nova Scotia-bound plane in Chicago. Nova Scotia Supreme Court Justice Peter Rosinski called it a "very unusual and difficult case." On Friday, Rosinski said he was satisfied that if police hadn't thwarted the plot, it would have been successful. Souvannarath is eligible to apply for parole after 10 years in custody, which would be February 2025. MacDonald pointed out that a life sentence comes with no end date. If Souvannarath does not show signs of rehabilitation, she could potentially remain in custody the rest of her life. Rosinski said he couldn't ignore the timing of her guilty plea. She was charged in February 2015 and pleaded guilty in April 2017 — only after she learned her social media conversations with her co-conspirator, James Gamble, would be permitted as evidence. In his decision, Rosinski wondered what carnage would have been inflicted that day. "One can readily infer multiple serious casualties." He said Souvannarath remains a danger to the public, and continues to show no remorse for her plan. Life was the strongest possible sentence, and means potentially that Souvannarath may never be released from custody if rehabilitation is not successful. "It certainly sends a clear message that anyone who would think of participating in something to this extreme, random killing of innocent citizens, will suffer serious consequences," said MacDonald. Gamble killed himself as police surrounded his Halifax-area home, while she was arrested at the airport. Randall Shepherd, a third accomplice, is a local man described in court as the "cheerleader" of the plot. He was sentenced to a decade in jail. When the judge asked Souvannarath if she would like to address the court prior to sentencing, the 26-year-old said: "I decline." The case also poses interesting immigration questions. The Canada Border Services Agency caught Souvannarath at the airport, before she was admitted into Canada. Crown prosecutor Mark Heerema says she's effectively on loan from immigration to the police while she serves her custodial sentence in Canada. If she is granted parole, a spokesperson from CBSA says she would likely face deportation.